Barton Beck has water in it now; it has not had water in it for years. The beck is more or less a hollow circle, and is like a large pond when it has water in it. It is difficult to give the size of it; it is a good size, perhaps 100-foot radius or maybe slightly more.It is situated between the two churches (St Mary's and St Peters) and goes back to at least the 1600's when they used to have Ducking Stools on the edge of it for people who had done wrong in the town and were to be publicly disgraced. The street Beck Hill runs alongside the beck between it and St Peter's church, this is a bit of a misnomer as it is not a hill at all, and only has a very slight incline. I remember when I was young; the beck always had some water in it. Even in the driest of summers there would be a pool of water in the bottom of it. In a winter the beck would always be full due to a couple of natural freshwater springs in there. The Beck had two brick culverts from it to take any overflow of water away should it become full; these are partly underneath Pasture Road and may also be partly under the former Hopper’s yard, eventually appearing as an open drain near where Pasture Road joins Butts Road; this open drain in turn emptied into the River Humber. Eventually over many years, parts of these brick culverts are believed to have collapsed, no one knowing where, and no means of finding out. As a result of this, the water-flow from the beck in a winter became less efficient and water would occasionally run over and flood onto a low point of the road next to it where Soutergate joins Beck Hill. The beck was below road level and when it was full the water would be level with the road. There were no walls around the beck at that time. I remember occupants of nearby houses at the North side of the beck having to sandbag their doors to keep the water out. In the 1960's Anglian Water constructed a new water pumping station about two miles out of Barton at Barrow Vale on the Caistor Road to help with the increasing demand for tap water. This lowered the water table considerably for miles around, and Barton beck dried up. There was no longer any water in it, even in a winter. The dish-shaped bottom of the beck started to look a mess with never having any water in it, and it was cleaned up and grass sown all over the bottom of it. This looked nice. Then someone thought it looked a bit plain and decided it would look better with some bushes in it. In the 1980’s the beck filled up and started to run over onto the road again and a brick wall was built around the beck, to stop the water going onto the road in a winter. 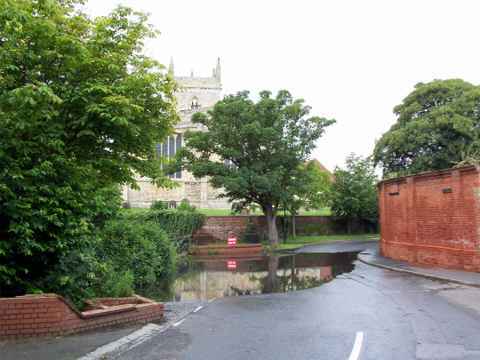 Also at that time a second overflow pipe from the beck was connected into a drain near to St Peter’s Church. The beck looked all right while the bushes were small, but by 2002 the bushes had become very overgrown and to my mind looked a bit of a mess. Now the beck cannot be seen at all from St Peter's for the trees. Personally I think it would look better without the bushes. I remember from my younger days there were a number of natural freshwater springs in and around Barton, most which would not have been active since the 1960's, but with the exceptional rain of the past year a lot of these will now be working, bubbling water up to the surface, and only the older generation will know where these have been, if they can remember, and even then some may have been forgotten about. Also the older generations will remember where natural ponds use to be in the town; long since dried up, these may now be re-forming, perhaps where someone’s garden or house is now situated. 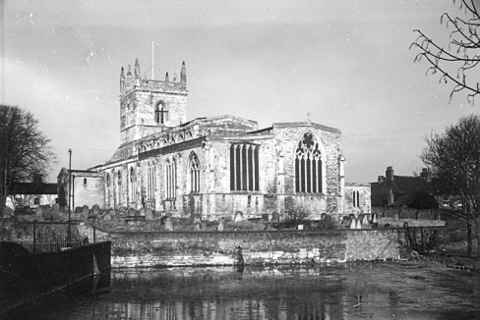 The early photograph shows how Barton Beck looked in 1960 with water in it and no bushes or trees, as viewed from near St Peter's Church looking towards St Mary's Church, and this is how generations of Barton people would have known it with the church reflected in the water of the beck. 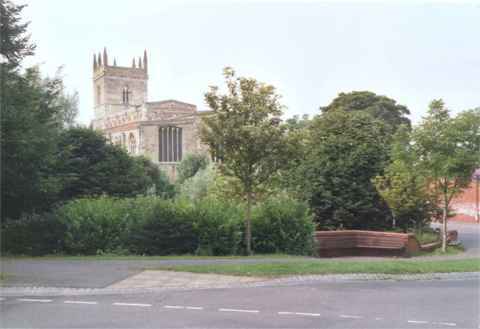 The later photograph was taken from the same position in 2002 when bushes and trees were growing in the beck and only the church could be seen not the beck. Today all that can be seen from the same spot is a wall of green leaves and tree trunks, neither the beck nor the church can be seen. It would be nice to have at least most of the bushes and trees removed on the side of the beck nearest St Peter’s Church so that local people and visitors can once again see the beck from St Peter's Church. With St Peter’s Church having recently been refurbished, more visitors to the town can be expected and will be seen. If these visitors can see St Mary’s Church across the beck they will no doubt feel inclined to visit that church also, and may walk into the town to look at other places of interest and eat at a restaurant or café.